Pagans celebrate a variety of holidays, depending on their tradition. Many holidays are linked to agricultural cycles and originate in pre-Christian religions. Pagans look to these ancient religions for inspiration, but also adapt their celebrations to the climate and culture in which they currently live. Other Pagan holidays honor specific deities or ancestors. Pagans who are focused on nature spirituality attune themselves to the rhythms of the natural world and let the seasons of waxing and waning, birth, growth, death, and renewal reverberate in their lives. Because the individual microcosm is connected to the larger macrocosm, Pagans locate their spiritual life not only in the world of nature, but within themselves. In this understanding, the wheel turns unendingly, but rather than repeating the same pattern, change is a constant. 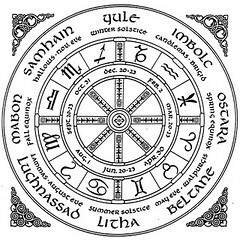 Nature-oriented and eclectic Pagans often celebrate the Wheel of the Year, a framework of celebrations that comes from Wicca. The eight Wiccan holidays are called sabbats and include the winter and summer solstices, the spring and fall equinoxes, and the four midpoints between them. 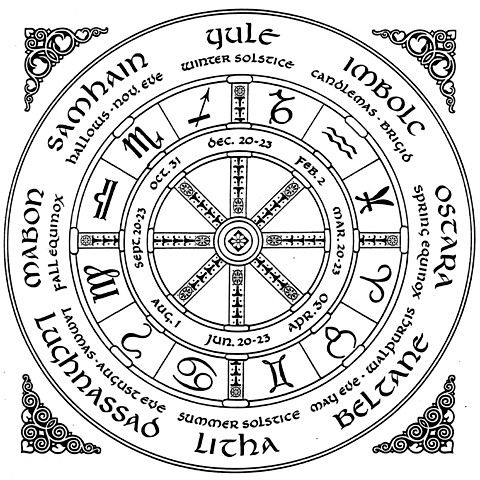 This ritual calendar is based on old Anglo-Saxon and Celtic traditions. The winter solstice, known as Yule, is celebrated around December 21, the time of year when the nights are longest and the days shortest. The solstice is also the inception of the light that will grow as days lengthen once again. Some Pagans stay up the entire night to greet the returning light, described by some as the birth of the Sun God. The spring equinox, which takes place around March 21, is named for the Germanic goddess Ostara and celebrates the balance between the light and the dark. The summer solstice, called Litha, is the inverse of the winter solstice. This day of the longest light, June 21, is often celebrated with all-night vigils and bonfires, and it is the crest of the summer and the forerunner of the harvest. The fall equinox, called Mabon, takes place on or around September 21, again a day of balancing of dark and light. In many traditions, the autumn equinox is a harvest festival. Evenly spaced between these are the four other festival days. Imbolc is celebrated on or near February 2, a day dedicated to Brighid, the Irish triple Goddess of smith-craft, poetry, and healing. Christianity adapted this celebration into Candlemas, and, as in ancient times, candles are often lit (or blessed for use in the coming year) on this festival day. It is a time of new beginnings and for formulating desires for the year to come, as well as a favored holiday for initiations. The springtime/early summer festival of Beltane occurs around the first of May. In celebrating the generative energy of the season, Pagans also honor the energy of sexuality and the fruitfulness of union. 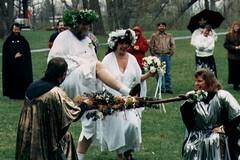 Many Pagans celebrate Beltane with a maypole dance, a ritual in which participants perform a simple, circular dance while holding strands of ribbon attached to a central pole. The result is a colorful braid wrapped around the pole. Often, a wreath of flowers is placed at the top of the pole, and this wreath slowly descends the pole as the braid is woven. The dance is playful and exuberant, with participants often decked in colorful costumes. Following the maypole dance, there is feasting, and baskets of flowers are sometimes exchanged. On the first of August is the summer harvest festival, Lughnasad, also known as Lammas. Those who practice Irish traditions often honor the god Lugh at this holiday, as well as his mother Tailltu, whose funeral games were traditionally held at this time. Wiccans often celebrate it as the wake of the Sun King. In a common Wiccan myth, the Sun King comes into being at the winter solstice, achieves union with the Goddess at Beltane, and dies at the summer solstice so that the wheel of life can continue. This late summer harvest festival is his wake, at which fruits of the harvest will be honored and shared. Samhain is observed on the eve of November first. This holiday marks the beginning of winter and the new agricultural cycle. Samhain and the eve of Samhain were widely observed even after the Christianization of the British Isles. Christian observance of All Saints Day on November 1 and All Hallows Eve (Halloween) on October 31 created a new context for this popular observance. Samhain is believed to be the night when the living can most easily communicate with the dead (especially beloved family members and ancestors). The beginning of winter, the time of death and decay in the wheel of the year, is said to be when the veil between the worlds of the living and the dead is the most permeable. The masks and images of ghosts and spirits that abound in popular celebrations of Halloween derive from the ancient belief that the dead can manifest in the material world on this night. For American Pagans today, Samhain is a time to meditate on loved ones who have passed away. Meditative trance-journeys to communicate with ancestors or deceased family and friends are part of many Samhain rituals. Some Pagans also honor their ancestors with a dumb supper, a feast eaten in silence with a full plate and an empty chair left open for the beloved dead. Other Pagan traditions celebrate seasonal transitions as well, but with differences in timing and meaning. Heathens have eight main common holidays that mark seasonal turnings, but they are less fixed to specific dates; Yuleblot, for example, is usually celebrated between December 19 and December 26 and may involve honoring the ancestors as well as the returning light. Instead of Beltane at May 1, Heathens celebrate Walpurgisnacht, a holiday devoted to Freya and other goddesses. Winternacht is observed around October 31, and while it may include honoring the dead, other groups mark the beginning of winter by making traditional offerings to particular gods and spirits. Some Heathens also celebrate additional holidays in honor of various gods and ancestors. These may include “Days of Remembrance” for those martyred during the Christianization of Northern Europe. Other reconstructionist religions also look to historical celebrations for their holidays. For example, Hellenic (Greek reconstructionist) Pagans often observe festival days in honor of the Olympic gods, such as Hera, Apollo, and Artemis. Pagan holidays, like Pagan ritual in general, are focused on nurturing relationships: between Pagans and the land, their gods, their ancestors, and each other. For many Pagans, the expression of joy and gratitude for blessings received is a central part of their religious practice. The many celebrations of the Pagan ritual year reflect the life-affirming attitude that characterizes contemporary Paganism.